For the Wilshire, over 8 trillion is expected to to transiently disappear. The elegance of the Asset Debt Macroeconomic System’s evolving repetitive deterministic mathematical fractal time dependent valuation patterns matches equally the elegance of the natural harmonic mathematical laws and scientific patterns of the observable universe. 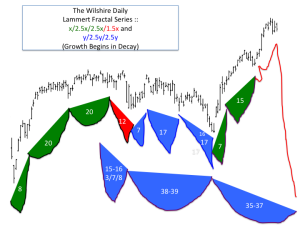 On an hourly bases the 2.0x length for the Wilshire’s 373 week second fractal starting on 4 October 2011 – with its 1.0x base fractal starting on 9 March 2009 and 136 weeks in length- was reached in the week of 12-16 December 2016. 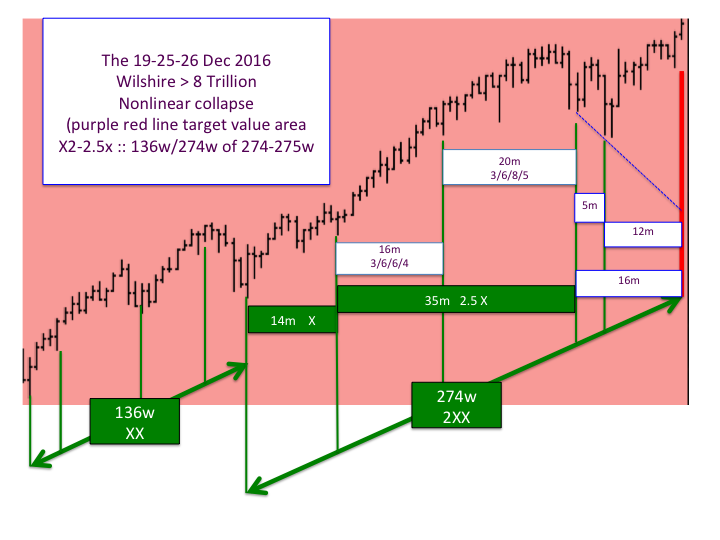 The Wilshire’s peak valuation was on the 5th hour of trading on 13 December 2016 and reached 23.8 trillion dollars. The Wilshire’s 373-5 week 2-2.5x decay pattern started on Monday 12 December during the 373th week and on an hourly basis is following a 4 phase declining growth pattern of 11/22 of 28/22/15 hours reaching a low on 27 December 2016.